Background Acute in situ thrombosis is an ischaemic phenomenon during Pipeline embolisation device (PED) procedures with potentially high morbidity and mortality. There is controversy regarding the role of platelet function testing with P2Y12 assay as a predictor of intraprocedural thromboembolic events. There is limited knowledge on whether procedural complexity influences these events. Methods Data were collected retrospectively on 742 consecutive PED cases at a single institution. Patients with intraprocedural acute thrombosis were compared with patients without these events. Results A cohort of 37 PED cases with acute in situ thrombosis (mean age 53.8 years, mean aneurysm size 8.4 mm) was matched with a cohort of 705 PED cases without intraprocedural thromboembolic events (mean age 56.4 years, mean aneurysm size 6.9 mm). All patients with in situ thrombosis received intra-arterial and/or intravenous abciximab. The two groups were evenly matched in patient demographics, previous treatment/subarachnoid hemorrhage (SAH) and aneurysm location. There was no statistical difference in postprocedural P2Y12 reaction unit (PRU) values between the two groups, with a mean of 156 in the in situ thrombosis group vs 148 in the control group (p=0.5894). Presence of cervical carotid tortuosity, high cavernous internal carotid artery grade, need for multiple PED and vasospasm were not significantly different between the two groups. The in situ thrombosis group had statistically significant longer fluoroscopy time (60.4 vs 38.4 min, p<0.0001), higher radiation exposure (3476 vs 2160 mGy, p<0.0001), higher rates of adjunctive coiling (24.3% vs 8.37%, p=0.0010) and higher utilisation of balloon angioplasty (37.8% vs 12.2%, p<0.0001). Clinically, the in situ thrombosis cohort had higher incidence of major and minor stroke, intracerebral haemorrhage and length of stay. Conclusions Predictors of procedural complexity (higher radiation exposure, longer fluoroscopy time, adjunctive coiling and need for balloon angioplasty) are associated with acute thrombotic events during PED placement, independent of PRU values. The Pipeline embolisation device (PED; Medtronic Neurovascular, Irvine, California, USA) has been increasingly used for flow diversion of cerebral aneurysms.1–8 Thromboembolic events are known risks of Pipeline flow diversion, with reported rates of 4%–20%.9 10 Due to the higher metal density of flow diverters compared with the traditional intracranial stents, dual antiplatelet therapy is routinely prescribed to mitigate the ischaemic risk during PED treatments. Adjunct preprocedural platelet inhibition testing has been proposed to assist with thromboembolic risk stratification. Several reports have suggested that clopidogrel hyporesponders (P2Y12 reaction unit (PRU)>200) are at higher risk for ischaemic complications and thus advocate for the titration of antiplatelet agents periprocedurally.9–16 However, multiple prospective studies of PED have demonstrated low ischaemic complications despite not using a titration strategy, and others have argued that the benefits of platelet function testing (PFT) prior to flow diversion are unproven.1 17–23 There is limited knowledge on what other factors may predispose acute ischaemic events intraprocedurally. In this study, we aimed to evaluate the role of procedural complexity on in situ thrombosis during PED placement in a single-centre series of patients. This study was an institutional-based retrospective cohort from a prospectively collected institutional review board (IRB)-approved database of intracranial aneurysms treated with PED and PED Flex at a single institution in the USA (The Johns Hopkins Medical Institute, Baltimore, Maryland) from April 2011 to August 2017. Patient demographics, aneurysm locations and postprocedural PRU values were matched between two cohorts, one with in situ thrombosis during PED deployment and one without. Indicators of procedural complexity included the following: (1) need for balloon angioplasty; (2) increased radiation exposure; (3) need for adjunctive coiling; (4) more than one PED used; (5) prolonged fluoroscopy time; and (6) cervical and cavernous internal carotid vessel tortuosity as previously defined.24 These indicators of procedural complexity were compared between the two cohorts, and statistical analysis was performed using Χ2 contingency tables. Clinical outcomes such as incidence of ischaemic stroke, intracerebral haemorrhage and length of stay were also collected. Data were presented as counts, percentages and means. When means were presented, SEM was used to assess sample distribution. All patients were treated preoperatively with daily aspirin 325 mg and clopidogrel 75 mg. Preprocedural antiplatelet regimen titration was not done. Patients who underwent multistage procedures and experienced in situ thrombosis after the first stage were transitioned to prasugrel 5 mg for 7 days prior to the second stage of the procedure. Assessment of P2Y12 response (VerifyNow, Accumetrics, San Diego, California, USA) was performed routinely on either postoperative day 0 or day 1. In cases where patients were found to have low PRU values (<30) and clinical signs of coagulopathy, medication changes were made postprocedurally; no action was taken for patients with elevated PRU values (>200). PED procedures were performed as previously described.2 3 25–27 Briefly, a triaxial system (long guide sheath, distal intracranial catheter, microcatheter) was used through an 8F short sheath femoral access. Systemic anticoagulation was administered with initial intravenous heparin bolus of 5000 units followed by 1000 units per subsequent hour. Control digital subtraction angiogram (DSA) was performed immediately after deployment and at 5 and 10 min after deployment to confirm vessel wall apposition and parent vessel patency, and to rule out acute intraluminal thrombus. If acute thrombus formation was noted on DSA, intra-arterial (IA) abciximab bolus of either 5 mg (for minor thrombosis) or 0.125 mg/kg (for major thrombosis) based on ideal body weight was directly infused through the triaxial system. Abciximab, a GPIIb/IIIA inhibitor, was chosen over eptifibatide and tirofiban for its αvβ3 and αmβ2 integrin receptor binding properties and its robust usage in the endovascular coiling and cardiac percutaneous coronary intervention literature. Concurrently, either 1000 units or 2000 units of intravenous heparin were administered based on the patient’s weight. Control DSA was performed at 5 min intervals after IA abciximab bolus. If significant thrombus persisted, additional 5 mg or 0.125 mg/kg IA abciximab bolus was repeated for a maximum of two additional times. In cases with complete recanalisation after IA abciximab treatment, intravenous abciximab was not used postprocedure. If residual thrombus was present after the IA bolus, then intravenous abciximab infusion at a rate of 0.125 μg/kg/min was initiated immediately and continued for 12 hours postprocedure. After each case, DynaCT without contrast was performed. The femoral arterial sheath was removed the following day. For those patients without medical or logistical contraindications, daily prasugrel (Effient) 5 mg or 10 mg (based on body mass index) was initiated and clopidogrel was discontinued. Patients were seen in follow-up at 1 month, 6 months and 12 months. Follow-up cerebral angiography was performed at 6 months and 12 months. During the study period of April 2011–August 2017, a total of 742 consecutive PED/PED Flex cases were performed by the senior authors (ALC and GPC). Of these 742 cases, 37 were identified to have acute in situ thrombosis intraprocedurally and treated with abciximab. The remaining 705 cases did not have acute ischaemic intraprocedural complications. The mean age of the patients was 53.8 years in the in situ thrombosis group and 56.4 years in the control group (table 1). The two groups were evenly matched in gender (83.8% vs 80.4% female, p=0.2535), history of subarachnoid haemorrhage (21.6% vs 15%, p=0.2788) and previous aneurysm treatments (24.3% vs 19.4%, p=0.4657). Postprocedural P2Y12 test results (PRU) were available in 70.3% of the cases with in situ thrombosis (26/37) and 59.3% of cases in the control group (418/705). There was no statistical different between the average PRU values of the two groups (156.1±61 vs 148.2±74, p=0.5894). The mean aneurysm size was 8.41±6.19 mm in the in situ thrombosis group compared with 6.85±5.55 mm in the control group (p=0.0952) (table 2). Anterior circulation aneurysms accounted for most of the cases in both groups (91.9% vs 92.5%, p=0.9184). Of the aneurysms in the anterior circulation, there was no significant difference between the two groups in the number of aneurysms beyond the internal carotid artery (ICA), such as aneurysms of the anterior cerebral artery or the middle cerebral artery (18.9% vs 18.3%, p=0.3173). Posterior circulation aneurysms accounted for 8.1% of the cases with in situ thrombosis and 7.7% of the cases in the control group (p=0.9204). Significant cervical ICA tortuosity defined as a 90° turn, hairpin turn or corkscrew loop was encountered in 38.2% of the anterior circulation cases with in situ thrombosis compared with 32.4% of the anterior circulation control cases (table 3). The cavernous carotid grade was also assigned for each case according to a previously published classification system.24 There was no statistical difference between the two groups in terms of cavernous carotid grade, with both groups having 50% of cases with grade 1 genu. Figure 1 illustrates a control case and figure 2 illustrates an in situ thrombosis case with procedural complexity. Cases in the in situ thrombosis group had a mean fluoroscopy time of 60.4±37 min compared with 38.4±25 min in the control group (p<0.0001). Similarly, the radiation dosage in the in situ thrombosis group was 3476±1855 mGy compared with 2160±1321 mGy in the control group (p<0.0001). There was no significant difference in the use of verapamil infusion (18.9% vs 12.8%, p=0.2792) between the two groups. The in situ thrombosis group required balloon angioplasty in 14/37 cases (37.8%) compared with 86/705 (12.2%) in the control group (p<0.0001). Although the in situ thrombosis group had 18.9% of cases that used more than one PED (compared with 13.9% in the control), this difference was not statistically significant (p=0.3933). Adjunctive coiling was performed in 24.3% of the cases in the in situ thrombosis group compared with 8.37% in the control group, which did achieve statistical significance (p=0.001). Standard, low-complexity example of Pipeline embolisation device (PED) treatment of an incidental 4 mm right-sided internal carotid artery (ICA) ophthalmic segment aneurysm. (A) Pre-embolisation digital subtraction angiogram (transorbital oblique view) of the right ICA and (B) three-dimensional rotational reconstructed image demonstrating the saccular right-sided ophthalmic segment ICA aneurysm, measuring 4.3 mm × 3.7 mm with a 3.5 mm neck (red arrow). (C) Single-shot fluoroscopy, lateral view, immediately following deployment of a single 4.75 mm × 16 mm PED across the neck of the aneurysm. (D) The right ICA injection, transorbital oblique view, confirmed a patent parent vessel and distal vasculature without evidence of thrombosis. This procedure was of low complexity, with 15.8 min of total fluoroscopy time, 827 mGy of radiation exposure and without significant vessel tortuosity or need for coils. Despite a postoperative P2Y12 reaction unit value of 297, the case concluded without thrombotic complication. (E–F) At 12-month follow-up there was complete occlusion of the aneurysm (E, transorbital oblique view; F, lateral view). 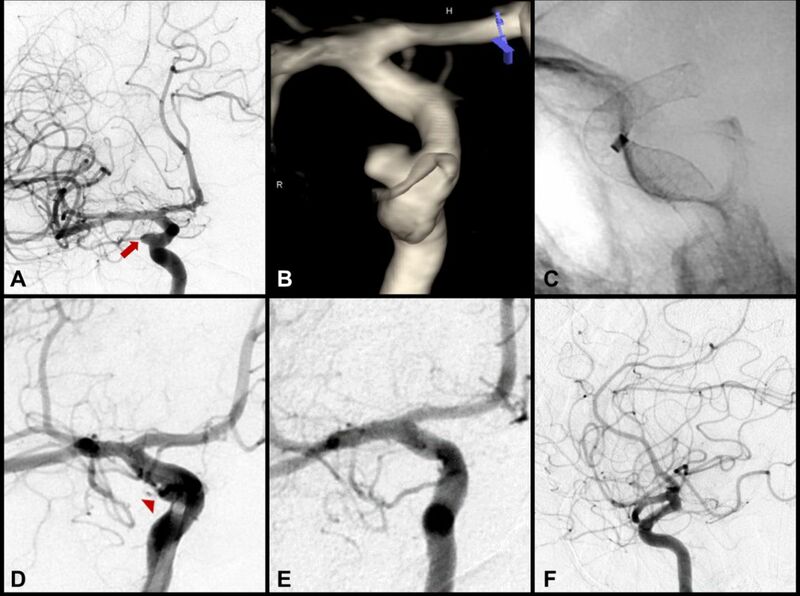 High-complexity example of Pipeline embolisation device (PED) treatment of a giant 25 mm right-sided petrocavernous internal carotid artery (ICA) cerebral aneurysm. (A) Right ICA digital subtraction angiogram (DSA; anteroposterior (AP) view) and (B) three-dimensional rotational reconstructed image demonstrating the right-sided 25 mm petrocavernous ICA aneurysm. Treatment of this aneurysm required complex PED deployment. (C) Twisting of the PED (red arrow) during initial deployment of a 5.0 mm × 30 mm device. Despite multiple manipulations, the twist was unable to be corrected and this device was removed without incident. An intracranial exchange was performed to establish a neutral microcatheter for subsequent PED deployment. Two telescoping PEDs (5.0 mm × 30 mm and 5.0 mm × 18 mm) were subsequently deployed. (D–E) Balloon angioplasty (D, pre; E, post) was used to improve wall apposition and device opening where the vessel was flattened from the mass effect of the aneurysm (white arrows in D). (E) Following angioplasty, the PED was widely open and well apposed (black arrows). (F) Post-PED implantation DSA demonstrating good anterograde flow in the parent vessel. The procedure was performed with 152 min of fluoroscopy time and 6109 mGy of radiation exposure, with a P2Y12 reaction unit value of 125. The patient awoke from the procedure in good condition. Shortly afterwards, the patient experienced a decline in mental status and decreased movement in the left upper extremity. Following a CT head that was negative for haemorrhage, the patient was brought back emergently for angiography. (G) DSA demonstrated multifocal platelet plugs (red arrowheads) in the Pipeline construct and reduced flow in the right anterior cerebral artery (red arrow). (H) An intra-arterial abciximab bolus was given with significant reduction in platelet plugging (black arrowheads) and improved anterograde flow (black arrow). The patient returned to her neurological baseline by the time of discharge. (I, AP; J, lateral) 12-month follow-up angiography demonstrated complete aneurysm occlusion and vessel remodelling with no evidence of in-stent stenosis or thrombosis. There was no statistically significant mortality difference between the two groups (2.7% vs 0.99%, p=0.3262) (table 4). The average length of stay was 5.62±8.05 days for patients with in situ thrombosis compared with 2.23±3.97 days for the control patients (p<0.0001); 94.3% of the control group patients were discharged to home compared with 72.9% of patients with intraprocedural thromboembolic complications (p<0.0001). The in situ thrombosis group had higher rates of transient neurological deficit (8.11% vs 2.41%, p=0.0370), major stroke as defined by NIHSS>4 (10.8% vs 1.2%, p<0.0001), minor stroke as defined by NIHSS<4 (2.7% vs 0.85%, p<0.0001) and intracerebral haemorrhage (2.7% vs 0.99%, p<0.0001). Iatrogenic vessel injury and dissection was only seen in 3/705 (0.43%) of the control cases but occurred in 1/37 (2.7%) of the in situ thrombosis group (p<0.0001). The flow-diverting PED, due to its bimetallic construct and 30% porosity, has increased thrombogenic properties compared with other traditional intracranial stents. Acute in situ thromboembolic complications during PED placement have potentially devastating neurological consequences. Recent studies on risk stratification have focused on clopidogrel responsivity, with some studies suggesting using the P2Y12 assay for antiplatelet regimen titration prior to treatment.9–16 In the current study of 742 consecutive PED cases, acute in situ thrombosis was seen in 37 instances (5%) despite no significant difference in postprocedural day 0 or day 1 PRU values. Indicators of procedural complexity such as prolonged fluoroscopy time, need for balloon angioplasty, increased radiation dose and need for adjunctive coiling were strongly associated with in situ thrombosis. These results suggest that PED can be safely placed without preprocedural titration of antiplatelet therapy and argue for procedural complexity as a risk factor for intraprocedural thromboembolic events. The role of PFT in thromboembolic risk stratification remains a controversial topic in the flow diversion literature. Delgado Almandoz et al reported increased complications with preprocedural PRU values >240 and <60 in a cohort of 44 patients.12 13 A recent retrospective, multicentred study of 402 patients by Adeeb et al 28 defined clopidogrel non-responders as having a PRU value >208 and concluded that the rate of thromboembolic complications in PED cases for this group was 17.4% vs 5.6% for the clopidogrel responders (PRU<208). In contrast, many authors have raised concerns regarding the variability in PFT values and the morbidity of haemorrhagic complications due to escalating antiplatelet regimen.18–23 In the Pipeline for Uncoilable or Failed Aneurysms trial, ischaemic complication rates were 2.8% despite 107 patients receiving PED without preprocedural PFT.29 Commentaries by Chandra18 and Gandhi21 have stated that there is insufficient evidence to justify routine PFT prior to neurointerventional procedures,22 while several retrospective studies have concluded PFT does not result in improvement of clinical outcomes.19 23 Within our institution, Bender et al 30 evaluated a series of 52 patients with PRU>200 undergoing PED treatment for intracranial aneurysms and found the rate of thromboembolic complications was only 4%, which was not significantly different from overall rates of cerebral ischaemic complications in the reported literature. Furthermore, the current study of 742 PED cases demonstrates no significant difference in postprocedural PRU levels between a cohort with in situ thrombosis (37 cases) and a control cohort (705 cases, of which 418 had PRU checked). The heterogeneous consensus regarding PFT points to the need to explore other factors involved in thromboembolic risk stratification. Longer fluoroscopy time, corresponding to higher radiation doses, is a proxy indicator of case complexity and technical challenges. Notably, the in situ thrombosis group required balloon angioplasty in 37.8% of cases compared with 12.2% in the control group. Since achieving satisfactory flow diversion is dependent on optimal device to parent wall apposition, in situ vessel anatomy and need for postdeployment processing are significant contributors to procedural complexity. In terms of patient selection, we often elect to avoid PED placement in patients with significant intracranial atheromatous disease in close proximity to the aneurysm to avoid the potential for atherosclerosis-induced malapposition and in situ thrombosis. Additionally, it is not surprising that the use of adjunctive coiling was associated with acute in situ thrombosis. Aneurysms treated with single-stage PED and coiling tend to be more morphologically irregular and the procedure itself more involved, in some cases requiring bifemoral access. Cervical ICA tortuosity, cavernous carotid grade and aneurysm size were not statistically different between the two groups in the current study, likely secondary to small sample size in the in situ thrombosis group and improved deployment of PED Flex in tortuous anatomy. Furthermore, these data suggest that procedural complexity is not simply limited to difficult access or aneurysm size. Intuitively, complexity leads to prolonged catheter time and endovascular manipulation, with the resultant platelet aggregation and activation leading to increased thromboembolic events. The limitations of this study include its retrospective and non-randomised nature. Because of the retrospective design, there is potential for inherent confounders and bias. The cause of in situ thrombosis is likely multifactorial and there may be other risks factors that were not evaluated in this study. The small sample size in the in situ thrombosis group also limits the statistical significance of various anatomical features of procedural complexity. Finally, postprocedural PRU value was not available for all patients. In this large single-institution study, predictors of procedural complexity (higher radiation exposure, longer fluoroscopy time and need for balloon angioplasty) are associated with acute ischaemic events during PED placement. Postprocedural PRU values were not significantly different between the two groups. The authors continue to advocate for PED procedures without preprocedural titration of dual antiplatelet therapy. Contributors BJ, GPC, L-ML, MTB, EMW and JKC drafted the manuscript and critically revised the manuscript for important intellectual content. MTB, JKC, RX and BJ assisted with the data collection and analysis. GPC and ALC performed treatment procedures and assisted in critically revising the manuscript. ALC, JH and RJT crucially reviewed the important intellectual content of the manuscript. ALC performed treatment procedures and critically revised the important intellectual content. All authors read and approved the final manuscript. Competing interests ALC is a proctor for the Woven EndoBridge (WEB) device (Sequent Medical, Aliso Viejo, California), a proctor for the Surpass device (Stryker Neurovascular, Fremont, California) and a consultant for Stryker Neurovascular, a proctor for the Pipeline embolisation device (Medtronic Neurovascular, Irvine, California) and a consultant for Medtronic, and a proctor for the FRED device (MicroVention, Tustin, California) and a consultant for MicroVention. GPC is a proctor for the Pipeline embolisation device and consultant for Stryker Neurovascular. L-ML is a proctor for the Pipeline embolisation device (Medtronic Neurovascular, Irvine, California), a consultant for MicroVention and participates in clinical trial for Stryker.